I think that vintage blouses are underrated. People often want dresses, and suits, but there are some wonderful separates that still exist from the 1940s and 50s, and adding them to your wardrobe can extend it quite a bit. One of the biggest names in blousery (not a real word, btw) was Dorothy Korby. She specialized in, well, special blouses for both day and evening, adorned with interesting and novel prints, trims and sometimes hand-painted details. She believed that “given a wardrobe of blouses and three basic skirts, a girl can dress herself with complete fashion assurance for every college or career purpose.”1 She obviously was a little biased, but the point is well taken. 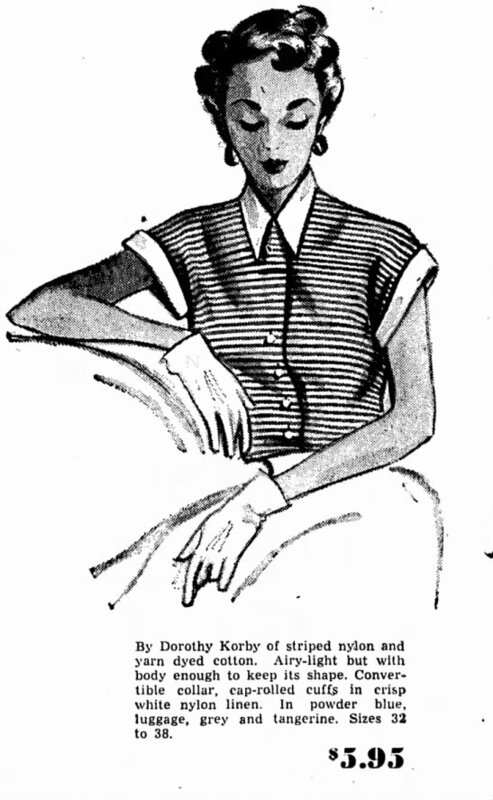 Korby often used cotton for day, but also created a line of day-to-night blouses of jersey, silk or nylon that included removable trim in, say, velvet that could be added in the evening, “for the girl who works (the favorite Korby customer)”2. Or perhaps they’d feature glittery stones or beading that would be hidden by a suit jacket at the office and revealed in the low light of evening. Her blouses were moderately priced, usually around $6-10, in the $55-$90 range today. She gathered a great deal of inspiration not only from the expected European sources, but she also referenced physical objects, like a clock she used to design a print, or a necklace she used to create a special neckline. By 1949, she had largely focused her talents on blouses, also designing skirts every now and then to support them. She hit her stride in the 1950s, though she continued to design through the 1960s. 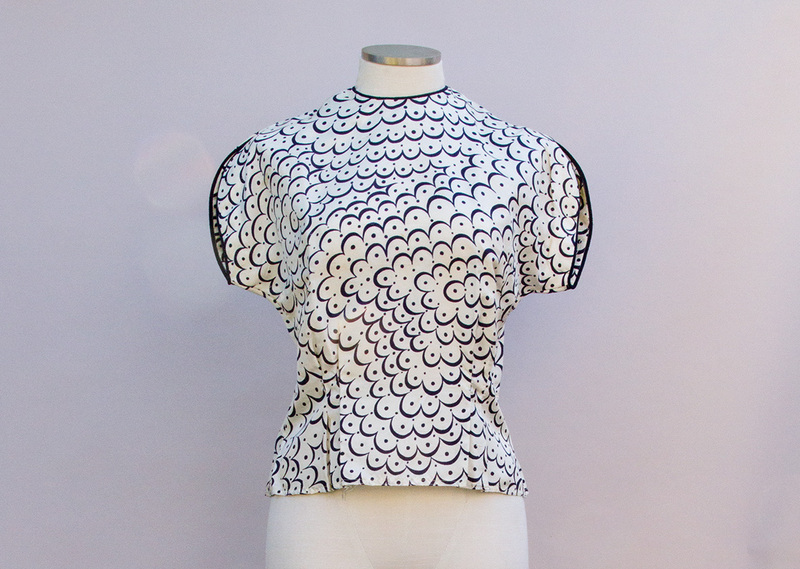 This blouse, just sold, is a lovely printed silk example from the 1950s. 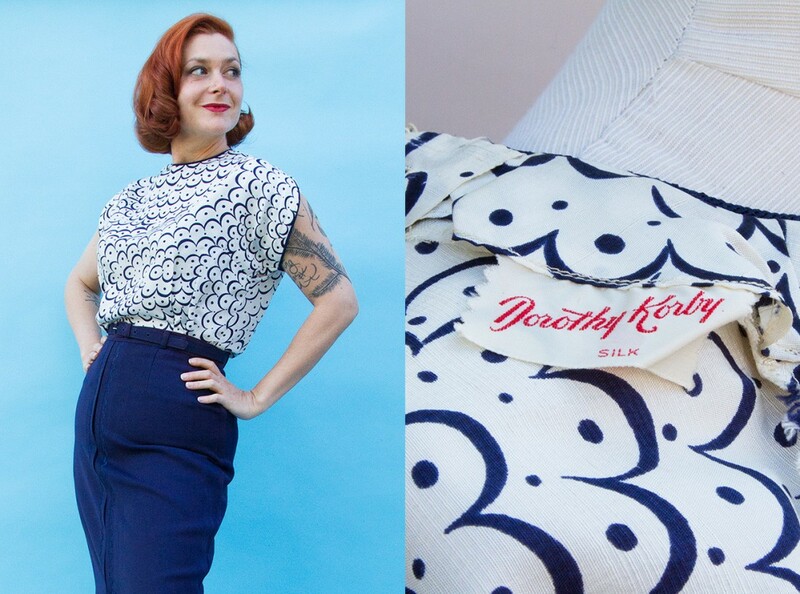 Today, Dorothy Korby’s blouses (especially novelty prints) are quite desirable. Expect to pay anywhere from $40 to $80 retail for an interesting example in good condition. 1 Syracuse Post-Standard, September 18 1951. 2 The New York Age, August 23 1952. Wow, this was wonderfully informative! I’ve never heard of Dorothy Korby but will be keeping watch now. I love the advertisement information too. Pockets like parking lots! Thank you for sharing this. I’m a new follower but I am extremely impressed at how organized and thoughtful your blog entries are. Thank you! I look forward to reading many more.